Imagine you are playing basketball with some friends. The player you’re guarding suddenly turns and elbows you in the mouth as they take a shot. It hurts, and you feel that one of your teeth is severely chipped. Uh-oh, you have a dental emergency! What would you do in that situation? Although you can’t plan when or how a dental emergency will happen, you can plan how you and your family will respond. Check out this helpful advice from your emergency dentist in Marion. In many dental emergencies, the faster you act to receive treatment, the better. Call your emergency dentist in Marion to schedule the soonest appointment to ensure that you get the treatment you need. For example, if your tooth gets knocked out, the sooner you come in, the more likely it is that the dentist can save your natural tooth. If you suffer injuries to your face, have significant bleeding, or have more extensive damage to your mouth or face, go to the emergency room first. If you feel pain during your dental emergency, use over-the-counter pain medication to manage it until you can come in. Use a cold compress on your face to reduce swelling and to help with any pain. When you have a chipped or broken tooth, cover any sharp parts of the tooth so it doesn’t impact any surrounding oral structures. Bite down on gauze until you get to the dentist. For a knocked-out adult tooth, you can try to put it back in its socket, but be sure not to touch the root. Then bite down on gauze to hold it in place. At minimum, keep the tooth moist by storing it in your mouth between your cheek and gums or in milk or water. For a cracked tooth, rinse your mouth with warm water to keep the tooth clean. Avoid using that tooth for eating. 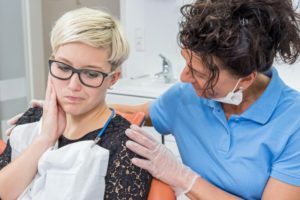 When you have a severe toothache, in addition to rinsing your mouth with warm water, you can also apply topical analgesics to numb the area around a specific tooth. If you can, you can try to gently floss around it to remove anything that might be aggravating it. If you lose a filling or crown, you can treat it much like a chipped tooth. For larger restorations, try to place your crown on your tooth and bite down on gauze to hold it in place. Again, these tips are just temporary fixes. The main thing you need to do in a dental emergency is contact your dentist right away for an appointment. Accidents can happen to anyone, and not all dental emergencies are preventable, but then again, some are. Here are some ways you can reduce the likelihood of having dental emergencies. Don’t use your teeth to open packaging or pry something open. Don’t chew ice or popcorn kernels. Be careful when chewing hard or sticky foods. Wear a mouth guard when playing contact sports, such as football, hockey, or basketball. No one knows what this new year has in store. Let’s hope for the best but prepare for the worst—just in case. You don’t want to suffer a dental emergency and waste precious time not knowing what to do. Have an action plan in place, so you and your family know how to respond if you have a dental emergency. For more information or advice about what do, contact your emergency dentist in Marion. At Bruner Dental, four talented, experienced dentists serve the Marion community in their dental needs. Most of the time, patients are able to schedule same-day appointments for dental emergencies. To contact them, call (765) 613-3128 or click here.